As the gathering comes to an end and Elko steadies itself after a rambunctious week, we are reminded how special this event is. This year was particularly great as so many different pieces came together creating the family reunion that we look forward to the other 360 days. Its sad to say goodbye to friends (both new and old), but these relationships will blossom year after year as long as people take time to visit. Get home safe, and keep in touch. Early this morning artists, annual Gathering goers, and new comers came together in a round table discussion focused upon the National Cowboy Poetry Gathering's future. The group focused specifically upon the growth and success that we would like to see over the next few years. Without filling the page with meeting minutes, I have taken the liberty of selecting a few topics from array of subjects that came to light as voices were heard and ideas were shared. The following is a bit of a jumble, and in some ways so was the meeting, so take what you want from it and let the rest wash over. How's the Artist Selection? There was a resounding belief that the selection of artists has been well thought out and chosen by the Western Folklife Center's staff. And in addition to having artists that are fun to watch, this selection of artists does not see the Gathering as a focus upon them, but instead a focus upon the people that make up Western folk culture. (They are here to see friends and meet new people just like the rest of us). Simply put, the Gathering retains its roots. Are we an event based upon inclusivity or exclusivity? There was an emerging dichotomy regarding what audience the NCPG should be focusing upon; ranch families that make up much of the area West of the Mississippi or people from urban centers all over. The Gathering started in the late 70s and early 80s by bringing local ranch families together to share and enjoy art, music and poetry. Today, ranchers and other hard working people continue to set aside time in their lives to get off the ranch and head to Elko. The Gathering has experienced changes and lulls in attendance over the last few years that have caused enthusiasts to worry about its welfare (making this one of the most important topics to address). Is this a Business or a Social Event? There are so many more fun events and strange happenings that many visitors either aren't aware of, or don't know occur. On any given evening you'll stumble across jam sessions, late night dance parties and even personal heroes. These are the parts of Western folklife that many find important. I for one, implore that each and every visitor sit down at a table filled with strangers or approach artists that you otherwise wouldn't, because this is exactly the right place to do it and we want to continue these traditions for years to come. The Western Folklife Center is not in the best position to support this event in the longterm without a good long look at how the business side of this event is related to its survival. Of course, much of these questions will need to be answered by Western Folklife staff. How do we bring new people in? Word of mouth and bringing a friend to visit the Gathering is simply not cutting it anymore, and the importance of getting the NCPG community involved in welfare and growth was a recurring theme. As well as keeping in mind that the local community and people whom work so hard getting this event going each year have a vested interest in the Gathering's continuing success. If you are one of those people traveling hours or even days to get here, you're a part of an effort to get the NCPG moving forward. 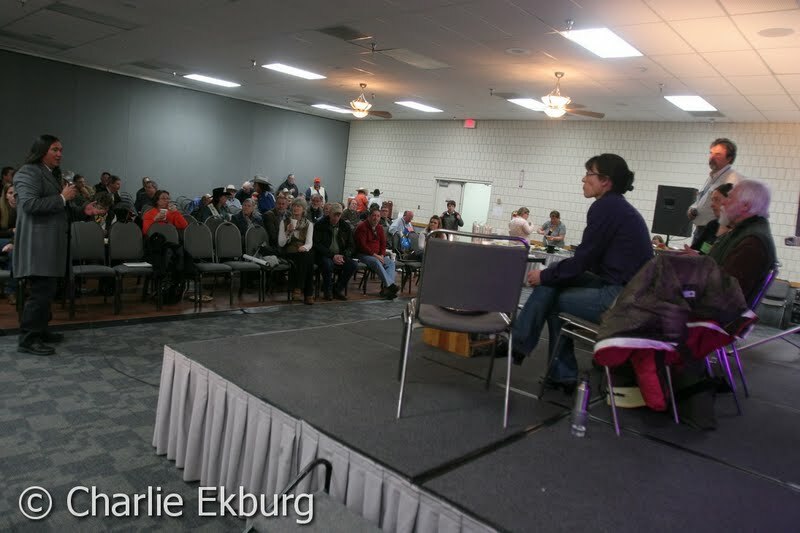 Getting involved with other events and forums in your hometown may be the way to assure that the Gathering remains in Elko over the next 29 years. There is a question about whether we should focus our efforts on social media (such as Facebook, Youtube or even this blog site). Much of this boils down to what audience we would like to pull into Western folklife. Sure, kids use these technologies but western folklife is all about focusing on arts by getting your hands dirty and meeting people. Grass roots conversation is how all of this got started, perhaps there is a way to keep this part of the event in tact. Is Our Focus Education or Entertainment? There is also a discrepancy with what age group we want to focus our efforts in developing the next generation of artist and visitors. Perhaps the "next generation" isn't what it seems (such as young children or teens) it could be college twenty somethings that are ripe for new experiences or single 30 somethings looking for something familiar. This is difficult to define, but is a critical question facing the Western Folklife Center and the people that love Elko. In Conclusion. There is a fear that if we reach out too far, we will lose what makes the NCPG and Western Folklife special. Artists are open minded and forward thinking when comes to understanding that the social environment we live in today (and Elko itself) are changing entities. Perhaps, this year's success will bring together an array of new ideas that will help expand our future. The NCPG is a truly amazing place, a place to meet family that you never knew you had. People from all walks of life are able to come down to Elko, making it a great place to not just see artists perform their craft, but also take the time to create friendships that last a lifetime. What is it that brings people to the NCPG year after year? Who is the target audience at the NCPG? How do we keep our community roots, while keeping a focus on entertainment/education? 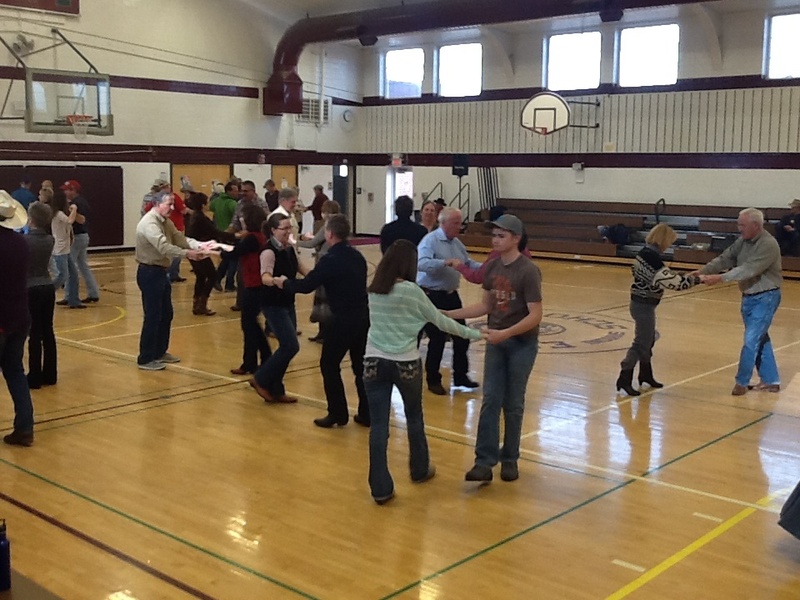 Today, dancers and would be dancers gathered in the High School gym to learn rodeo swing. The event began with an informative yet simple introduction by Craig Miller and Amy Mills that got people up and moving in no time. Some attendees may have been intimidated by the dancing prospect, but Craig instilled confidence by explaining that there is "no right way to do these steps." A class like this allows smiles, laughs and mistakes that result in a bunch of great dancers. Craig gives the tools needed to move feet in the right direction, and allows you to fill in the rest. If you plan on attending one of these classes be sure to leave all your bashful baggage at home because its time to dance. Water can be a 'dry' subject but today's panelists enlightened the attendees through engaging conversation about watershed development. Each speaker explained that we as a society need to widen the lens as we search for solutions to changes that are fast approaching. Water is simply a big issue in the American desert and we have the ability to engineer successful change if we approach the problems and questions with open minds. We need to recognize that both agricultural water use and drinking water are important, but they develop and sustain different forms of societal growth. There was so much in this discussion that the speakers couldn't get to, but below is a summary of the ideas and information the panelists provided. Jack Loeffler, "Thinking Like a Watershed" and "Headed Upstream" Jack gave a brief, but dense history about how modern water management has been formulated. Over 120 years ago John Powell rode across the American West creating a detailed map of the territorial watershed. Powell proposed that the watersheds should be the driving factor for defining state lines so that each area could derive their own self sustaining plan. However, once the watershed had been made public, entrepreneurs descended upon those watersheds with regulation and control. This money and land grabbing has led to a focus upon money making rather than a focus upon creating regard for the land that we live on. The Law of the River in which different states were afforded fixed amounts of water is controlling water growth today and is an important part of understanding where we have come from, and the limits of where we are going. Lisa Hamilton, "Deeply Rooted" Lisa spoke about how water is being utilized effectively today, and how there are practices that aren't so well defined. Instead of wondering why we put a million person city in the middle of the desert (like Las Vegas), we need to ask, what is important for our future and we have to ask how we will use low precipitation land effectively. As a whole, we need to take into account the importance of regional effects, and create a relationship with water that represents where we want and need to be. "The West begins when annual rainfall falls below 20 inches," this quote rings true the fact that western states have a distinct climate that should and does directly reflect the way we utilize water. Alexandra Davis To start, Lisa stated that 'We have enough water for the West,' but included that we need to develop a relationship with water that accurately reflects what is important when sustaining a thriving society. Most of the water comes in the winter as snow pack that will then fill rivers in the warmer months. However, this system of 'water storage' is quickly changing today. Annual precipitation is changing from snow to rain, which will challenge our current water storing methods. The Prior Appropriation Doctrine solves many local issues but has difficulty tackling the regional water problems because it creates a winner/loser mentality. Care for the environment and focused discussion about agricultural growth together is a key to creating a sustained system of water usage. We are focused upon our personal economic sustainability far more than the landscape in which we live. It is important to avoid growing beyond the sustaining capabilities of the land. Mary McCaslin has honed her style from folk's deepest roots. Even a short performance at the Flag View Stage didn't fail to take the audience back to some of songwriting's best years. Her influence on contemporary Western folk music is evident with songs that explain life's experiences through the looking glass. Her steady hands worked with the guitar effortlessly, and some could hardly wait to see her unique use of the banjo. Mary stays true to each song without flaunting her skills; allowing the audience to surrender to the music. 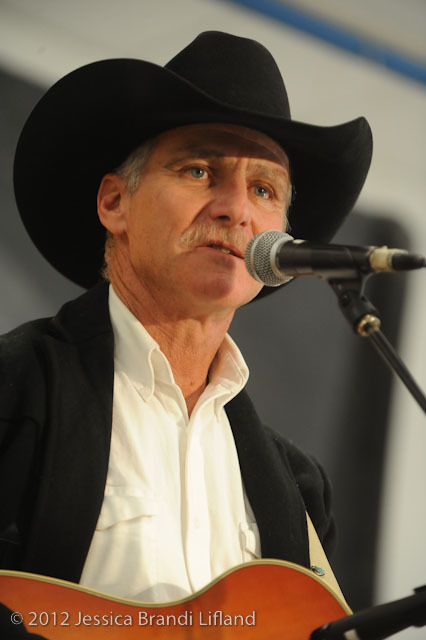 The international side of this event is so vital to the National Cowboy Poetry Gathering coordinators because ranch hands and bronco breakers from around the world have been so important to the culture that the American West has today. Charlie Seemann explains that horse people are horse people, and we are all able to come together in Elko and share stories that cross borders and time. All of this helps create relationships that will last a lifetime. Sharing stories of the corral and landscape reminds us that people working cattle and horses from around the world are not so different than those in the American West. Today was a great showcase as the Italian duo Gianluca Zammarelli and Marco Rufo played casually before a happy audience. People enjoyed food, wine, and great company as Gianluca and Marco played songs from home. In addition, Gianluca took time to teach the audience about their musical style and instruments. The anatomy of the bagpipe is much like that of a family, a group of parts put together to make amazing sounds and feelings, and there is a cross hidden within the facets of the pipes to keep the devil away. Today Italian tradition lives on in America spurred by Italian immigration West over 150 years ago. In fact, many of the cowboys and ranchers today have roots in Italy. Blue jeans were invented in Genoa, Italy to give a strong pair of pants to sailors. It wasn't until Levi patented the pocket's copper rivet that the blue jean became marketed and popular in the American West. Buffalo Bill and his troupe visited Italy eight times, and was once issued a challenge as to who may be the better bronc rider: the American cowboy or the Italian butteri. Although the results of this challenge may vary between America and Italy today, there remains a legend that a butteri by the name of Agusto Imperiali conquered the American horse. Glenn Ohrlin has certainly been at this for many years, and as he stepped onto the stage a 12- year old Brigid Reedy followed closely. The theatrical arguments between the pair and the passing of folk tradition was magical to watch. 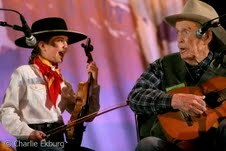 75 years between them certainly didn't let on as they played great music today, and it is great knowing that the next 30 years of cowboy poetry and music will be carried on by talented young performers like Brigid. First time National Cowboy Poetry Gathering visitor, Ed Peekeekoot took the auditorium today after a standing ovation finish at the Flag View Stage yesterday. And like an old friend to the Gathering, Ed talks smooth and shows massive amounts of confidence and class. His stories about growing up on a reservation listening to friends play popular rock and roll chords is a great dimension of growing up. During those years he found his own music with influence form Chet Atkins and Merle Travis, all leading to an amazing ability to layer chords into musical melody. 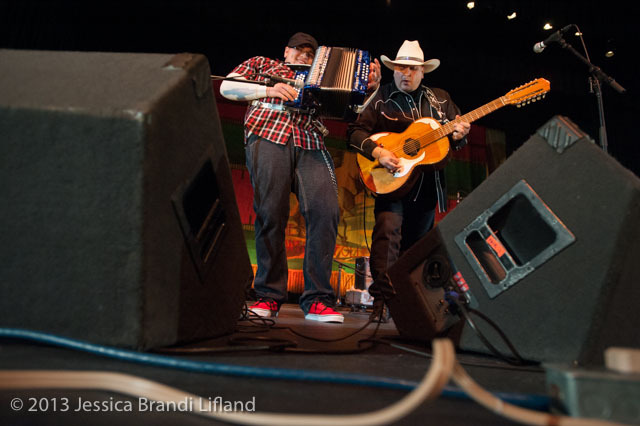 Ed is a fresh and fantastic way to fall in love with Western folk traditions. With the help of his wife, Gail, Ed provides a good time for everyone in attendance and comes across as the kind of person that you could stand up and party with. Ed is fast making the list of favorite artist this year and certainly one that you shouldn't miss out on. Last night the Roughstock Cocktail proved to be a great mix of music, poetry, and comments regarding Paul's sagging derriere. The show's name did not fail to provide as the amazing cast mixed equal parts of flavor and zest with music and story. The performance opened to an audience nearly bursting at the seams, and a rousing introduction to LSD by Paul Zarzyski got the crowd's energy pumping. The stage was not short on talent as Cowboy Celtic lulled the audience with sweet melodies, and Paul Zarzyski and Wallace McRae provided all the in- between with word and poem. 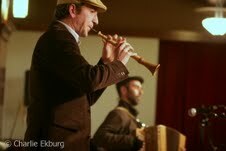 Even the silent duo, Nathan and Joe, impressed the audience using their instruments to create strong stage presence. Quips and jokes by the rest of the group kept cheers and laughter pouring. Simply put, it was a great time watching this motley crew up on stage doing what they love. Giving way to good old fashion fun. After the show an impromptu musical bash between Cowboy Celtic and the Italian duo Marco Rufo and Gianluca Zammarelli broke out in the G Three Bar Theater. And with a bit of trial and error at the beginning, the bands soon melded together keeping the those in the Pioneer Saloon entertained for hours. If you hang out at the Folklife Center long enough you're sure to see the Italian musicians walking about playing bagpipes and accordion. It's quite fun to see Marco and Gianluca banter back and forth about rhythm and song choice, even if you don't understand Italian. In this session, Jess Howard and Georgie Sicking shared their stories about the simpler parts of the western lifestyle, while Keith Ward intrigued us with what it meant to be a cowboy as we grew up watching great American heroes. Together, they remind us that being a cowboy is not all work and strife; that it's made up of plenty of laughs and fun. Most of all, they reveal that each day is special as long as we strive to be our own cowboy. Today's session "A Changing West" presented great stories and songs by John Dofflemyer, Henry Real Bird and Gail Steiger. Each painting beautiful pictures of the West. Although lament for the western way may have been the topic, these poets painted pictures not just about the changing West, but also how the West is still out there for all of us to explore. John Dofflemyer revealed that poetry can describe so much more than a something we see. Gail Steiger asked us to take a look at the West that remains as we visit Elko, and Henry Real Bird reminded us that the National Cowboy Poetry Gathering is a place to explore some of these lost (but needed to be rediscovered) places and traditions. By the end, they showed us that the West can be found in the poetry that it keeps it in our hands and in our hearts, proposing that the changing West is only the whitening of our hair.